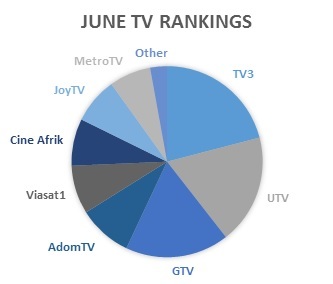 GeoPoll measures TV ratings daily in several African countries, and using our Audience Measurement Service we were able to track TV ratings over the summer and see how stations fared each month. Today we are looking at the summer TV ratings for Ghana. Our service collects ratings from the most popular stations in Ghana, determined by our own research and open-ended surveys: UTV, TV3, GTV, AdomTV, CineAfrik, Viasat1, JoyTV, and MetroTV. Looking at the month of July, UTV became the most popular station with 825,885,105 viewers. This greatly surpassed TV3’s record from June. The World Cup was winding down in the early weeks of July. This explains why a non-World Cup station was able to take the lead, even though World Cup viewership was so high. During July, TV3 had 661,005,079 viewers and GTV had 500,976,325 viewers. 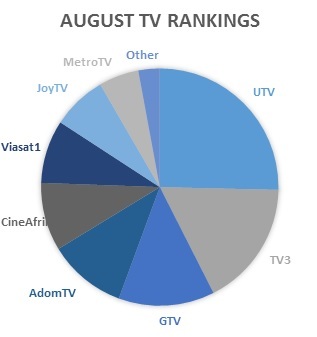 During the month of August, UTV was once again the most popular Ghana station. UTV had 761,645,940 total viewers during August. This is a significant drop from the previous month. For the first time in two months, CineAfrik rose above Viasat1 with 278,594,624 viewers. Viasat1 had 258,745,754 total viewers during August. Want to learn more about our Audience Measurement service? Continue to read our blog where we regularly post insights from our data, and click below to subscribe and access daily TV & Radio ratings. Next week our blog will cover summer TV viewing for Kenya.